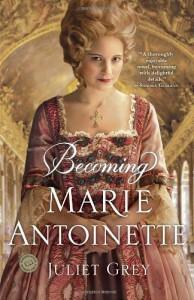 I received my copy of Becoming Marie Antoinette by Juliet Grey through goodreads First Reads giveaways (thank you!) and I really enjoyed it. Becoming Marie Antoinette is a novel that covers a very young Marie Antoinette (she is ten when the book starts). I went into this not knowing much about her except how her life ended. Although this is a work of fiction it was a fascinating read. It was very apparent that the author spent a lot of time on research. 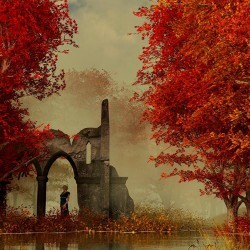 The book is filled with historical tidbits but they are written seamlessly into the story. I also loved how descriptive the author is. I felt like I was actually sitting in the garden with Marie Antoinette during her lessons or helping dress her in her elaborate clothes. There is so much attention to detail in the book but it never overwhelmed me. My friends know that I am not a fan of first person by rule, but there are always exceptions. This book is one of those exceptions. It helped that I liked Marie from the very first pages. She is charming and graceful and very warm. This is apparently the first book in a future trilogy. The only thing that worries me is that I really liked Marie Antionette in this novel and I also know how her life ends. I still plan on reading the others when they come out although I already have a feeling they will be heartbreaking. I am so glad that my first goodreads firstreads win was such a good book!